Posted on July 22, 2017 October 24, 2017 by Alice Fisher M.A., M.S.W. It has been documented by many researchers, including Becca Levy of Yale, that ageism when internalized cuts short a person’s lifespan. And, yet ageism is sometimes not even recognized by its victims. When an older adult says, “I, personally, have never encountered ageism,” my usual reply is, “You must be satisfied with the amount of your social security payment.” There is always that moment of “aha” when I say this. Yes, the amount of income we receive from social security has ageism written all over it. When someone calls you an ageist, are you as upset as when the same person calls you a racist or a sexist? If not, ask yourself why. Ageism is as systemic as racism. Both ageism and racism are built into the fabric of our society, and is expressed by individuals, institutions, and our government. Ageism and Racism have a significant impact both on the individuals who experience it and the wider community. Research shows that there are significant links between experiences of ageism and/or racism and discrimination and poor physical and mental health, reduced productivity and reduced life expectancy. Further, it is well-recognized that ageism and/or racism presents barriers to social inclusion and economic participation. Ageism is as insulting as ableism. While the country prides itself on its increasing acceptance of traditionally marginalized populations, old people and disabled people continue to be stripped of their voices, and it’s hurting everyone. “Ableism” refers to attitudes in society that devalue and limit the potential of persons with disabilities. Not unlike ageism, ableism targets people with disabilities as being less worthy of respect and consideration, less able to contribute and participate, or of less inherent value than others. Similar to ageism, ableism may be conscious or unconscious, and may be embedded in institutions, systems or the broader culture of a society. It can limit the opportunities of persons with disabilities and reduce their inclusion in the life of their communities. Ageism is as hurtful as homophobia. Homophobic bullying is behavior or language which makes a person feel unwelcome or marginalized because of their actual or perceived sexual orientation. Although not referred to as “bullying”, elder abuse also makes a person feel unwelcome and marginalized as the result of ageism. In so many ways, an abused elder, is also a victim of bullying…elder bullying. Some of the more common forms of elder abuse and homophobic bullying include: verbal bullying, indirect bullying by way of social exclusion, and physical bullying. The effects shared by bullied homosexuals and abused old people include; denial of sexual orientation and/or denial of one’s age, low self-esteem, shame, depression, defensiveness, anger and / or bitterness. All of this leads to risk-taking behaviors, including substance abuse, self-harm and/or suicidal thoughts. Ageism is everywhere like sexism. You don’t have to look further than the oval office these days to know that sexism is alive and flourishing these days. And, add to that the fiasco at Fox news which seems to be a bastion of sexual harassment. This is just blatant in-your-face sexism. Yet, sexism, just like ageism, is often hidden in plain sight. Although ageism is practiced against men as well as women, for women it looks very different, and it’s found everywhere. 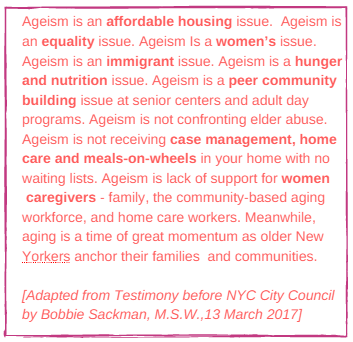 Ageism is a women’s Issue. Women are still the majority of caregivers to the elderly, and perhaps this why there is still a deficit in caregiver resources. Think about it. How would the picture change if men were the primary caregivers, both professional and personal? According to Caring Across Generations, more of us are caregivers than ever before. Nationwide, there are more than 41 million family caregivers who are doing the important work of caring for a loved one, often while juggling a full-time job. Ageism is a healthcare issue. In reality, 70 percent of Americans older than age 65 will need some form of long-term care (Kane, 2013). This denial of the need for care is comprehensive public−private partnership in long-term care is to perpetuate ageism—denial of growing old is ageist. http://www.asaging.org/blog/public-policies-we-need-redress-ageism . Much of the public policy in our country smacks of ageism. When adequate resources are not allotted to senior services, when social security doesn’t reflect the cost of living, when people are on waiting lists for necessary services like meals-on-wheels or casework, ageism can be found as the root cause for so many of these issues. Ageism is an economic and political issue. Like racism and sexism, ageism serves a social and economic purpose: to legitimize and sustain inequalities between groups. It’s not about how we look. It’s about how people in power assign meaning to how we look. Last, but not least, ageism is an inter-generational issue. Young adults who hold ageist views are setting up discrimination against their future selves. We may not all be victims of racism, or sexism, or antisemitism, yet if we are fortunate to live a long life, we will all have the opportunity to be victims of ageism. Because of longevity, it is more a certainty that many of us will need help to sustain ourselves through our later years. Younger generations must be prepared to offer a helping hand to the oldest and most vulnerable among us. To achieve this, we need to build a co-dependent society where we all recognize ourselves in the faces of our fellow human beings. Let’s give ageism the same respect we give to racism, sexism, homophobia and the rest. Older adults deserve our respect as do the issues that marginalize them.